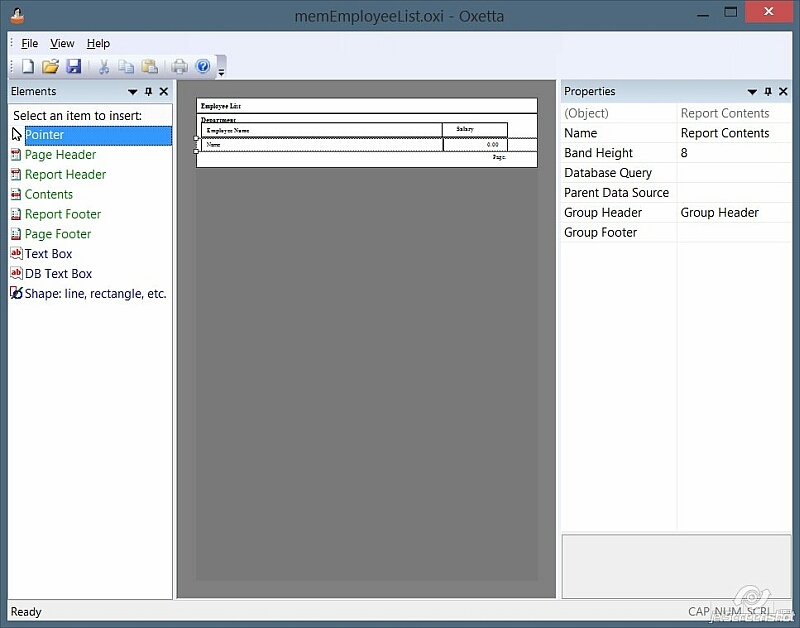 Oxetta is a powerful reporting solution, primarilly designed for the C/C++ software developers. Oxetta consists of the printing engine itself designed as a DLL file, and the report generator tool used to create the reports you'll use in your software. Oxetta is able to connect to your SQL database thru ODBC in order to retrieve data to print, or retrieve that data from your application using callback functions, or use both approaches. And yes, Oxetta is free for all purposes. When creating reports, you use the Oxetta application that allows you to design reports in a nice graphical interface, traditional for the applications of this kind, so you will not have to spend hours trying to find out how to work with Oxetta. Please click here for the screenshot. When distributing reports, you distribute Oxetta DLL file which is only 500 kilobytes in size, and your report files that are a few kilobytes each. Download the free Oxetta reporting engine right now, learn how to design reports with it and start designing reports with Oxetta and make your printing work easier!